Surface mount. An adjustable shelf divides this cabinet into two compartments, one for the AED and the other for emergency oxygen or medical kit. 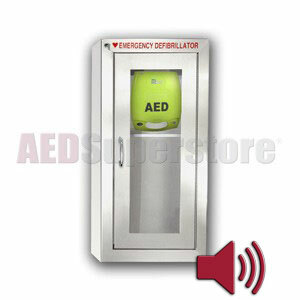 ZOLL® AED Plus® Tall Stainless Steel Cabinet with Audible Alarm. When good looks matter, this sturdy and attractive cabinet is ideal both for indoor applications and sheltered outdoor applications. This cabinet contains a bracket exclusively for use with the ZOLL AED Plus model defibrillator. A shelf divides the cabinet into two compartments, one for the AED and the other for optional equipment such as emergency oxygen or a first aid kit. Shelf is adjustable from 12.5" to 17.5". Door-activated alarm and flashing strobe light that alert everyone the AED has been deployed for rescue. Strobe light adds 3" to cabinet height.